On November 14 1951, following the strong rainfalls that swelled the course of the Po river, the region of Polesine was devastated by catastrophic flooding that hit most of the Rovigo province and a portion of Venice’s province. It was the biggest catastrophe of post-war Italy. Elisabetta Benassi has constructed her work for the Italian Pavilion in the 55th Venice Biennale with that same clay from Polesine, a region close to Venice. 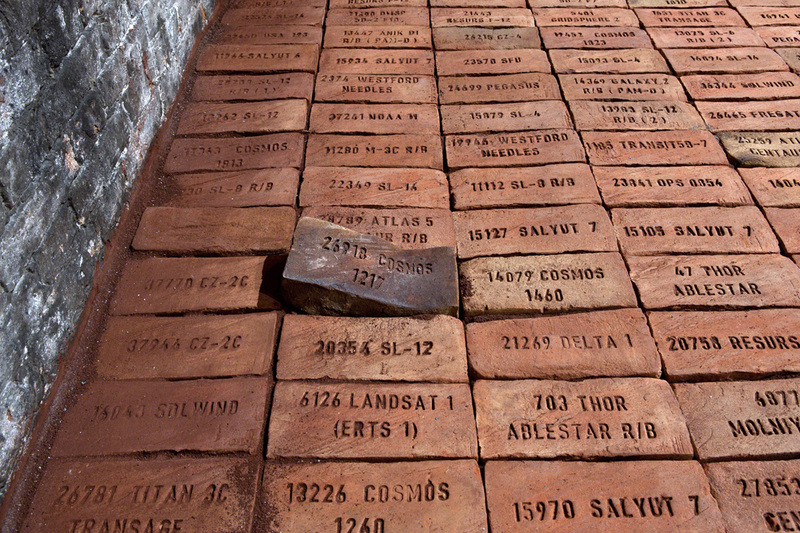 A space measuring approximately 15×15 meters, a slightly inclined flat surface, like a sort of upside down sky, over which the audience is allowed to walk; a floor made of ten thousand bricks, each measuring 12×25 cm and with a variable height from 5 to 10cm, that transforms the ground into an uncertain space. Each of these “dry salvages” bears the name of a space debris, a single fragment of a satellite or spacecraft that is left in outer space and orbiting around the Earth, possibly for eternity. The installation is built around an unusual archive of the human presence in space: the catalogue of ten thousand pieces of “space debris”. These peculiar objects bear a symbolic signification for the artist, not only as remnants of the “Space Race” of the past fifty years, but also as material and metaphorical traces of the unintended consequences of the technogical development: a revolved mirror, a sort of “catalogue of errors” that fascinates and threatens us at the same time. The installation includes a book, a kind of guide to the biggest ten thousand of space debris orbiting around the Earth. Inside, each fragment will be identified through its cataloguing information: International lD designator, Name, Debris Size, Launch Time etc., with all the indications about inclination of the orbit, Apogee, Perigee, Radar Cross Section, Mother Body Name.